As any dog owner can attest, the modern pet food market is practically bubbling over with choice. At least that’s the way it seems. Producers certainly do a wonderful job of making it feel like they’re offering consumers an abundance of choices, with “Limited Ingredient Diets,” “High Protein Diets,” and, of course, “Grain-Free Diets” being just a few of the more popular varietals on offer. In recent years, the term “grain-free” has enjoyed a particularly good run. Industry analyses suggest that it already is one of the most popular segments of the pet food market and that its popularity is continuing to grow. It seems clear that the term “grain-free” has become, in many circles, an indicator of premium quality and healthfulness. But what does it actually mean for a pet food to be “grain-free”? Are there any real, demonstrable health benefits to these products? And, if so, which brands do the best job of providing those benefits? Now, for those looking to understand the conceptual framework behind these answers (or extend lunch hour by a few minutes), a bit of elaboration. What Does “Grain-Free” Really Mean? The Association of American Feed Control Officials is the body that, for all intents and purposes, regulates the majority of what can and cannot be printed on a pet food label. And AAFCO considers the following ingredients to be “grain products”: barley, corn, grain sorghum, oats, wheat, rice, and rye. So, naturally, any “grain-free” pet food cannot contain any of those ingredients. Now, if you know a bit about how pet food is manufactured, you might think this list would pose a problem or two for manufacturers intent on making “grain-free” dry kibble products. For one, these commodity crops are all among the cheapest sources of calories known to man—and that’s not exactly good news for a profit-minded manufacturer. Even worse, they all contain an abundance of the carbohydrate molecule starch. And starch plays a critically-important functional role in the kibble-production process. In essence, starch gets sticky when it gets very hot, so it serves to bind the rest of the ingredients together as they bake, just like flour does when you bake cookies. Take away the starch, and your cookies (or kibbles) are likely to simply fall apart. Fortunately for “grain-free” pet food manufacturers, there’s a way around these problems. They can just use potatoes, sweet potatoes, or some other combination of tuber ingredients instead of grains. Tubers are bulbous plant structures that grow underground. And, just like grains, many of them are both (1) wildly inexpensive and (2) crammed with starch. For those reasons, they represent the perfect workaround for a pet food manufacturer intent on producing a “grain-free” kibble product without breaking the bank. So, in the vast majority of cases, the defining attribute of a “grain-free” dry pet food product is simply that it uses tuber ingredients like potatoes or yams as a source of starch instead of grain ingredients like rice, corn, and the rest. Are “Grain-Free” Foods Actually Healthier For Pets? To answer this second question, it is important to also appreciate what it doesn’t mean for a pet food to be “grain-free.” More specifically, it is vital to understand that whether or not a product is “grain-free” is all about its ingredients; it is not at all about its nutritional content. The difference between ingredients and nutrients is a hugely significant one when it comes to understanding the healthfulness of a pet food. And it’s the improper blurring of the line between the two terms that, I believe, is largely responsible for the popularity of “grain-free” pet foods in the modern market. Nutrients are the aspects of food ingredients that organisms actually use to survive and grow. Broadly speaking, they include macronutrients (proteins, carbohydrates, and fats), which provide metabolic energy and the bulk raw materials needed for tissue growth and maintenance, and micronutrients (vitamins and minerals), which are required in trace quantities in order to help propel those bodily processes along. Ingredients are food products that are composed of nutrients. And this means that two very different ingredients can actually have quite similar nutritional contents. In fact, we’ve already seen a prime example of this—from a producer’s perspective, tubers and grains both make useful dry pet food ingredients because they both contain a great deal of the carbohdyrate molecule starch. In other words, the real question we ought to be asking when thinking about the healthfulness of a pet food is not what are its ingredients (i.e., is it “grain-free” or not?) but what is its nutritional content? Most consumers are well aware of this. And if the mainstream media and Google’s historical data on search trends are anything to go by, they’re particularly interetsed in one specific nutritional issue: restricting carbohydrates. There’s undeniable evidence that dogs avoided carbs completely for more than 99.9% of their genetic evolution. There’s undeniable evidence that carbohydrate consumption causes profound metabolic and hormonal changes within a dog’s body. There’s very strong evidence that carbohydrates are more fattening for dogs and cats than other nutrients. And there’s a limited (but growing) body of evidence suggesting that carbs are playing a significant role in the development of some common and deadly chronic diseases. On the other hand, I’m not aware of any evidence supporting a theory that grains are more harmful to dogs and cats than any other starch-rich ingredients. For instance, experiments have been performed confirming that the glycemic impact of grains is roughly the same as the glycemic impact of other starchy ingredients (i.e., they both cause massive blood sugar and insulin spikes) in dogs. For all these reasons, it seems crystal clear to me that what consumers really care about is the carbohydrate content of pet food products, not whether those carbohydrates come from grains or from potatoes. So let’s close the loop on our analysis of “grain-free” dry dog foods by looking at the subject of carbohydrate content more directly. Which “Grain-Free” Dry Pet Foods Are Lowest in Carbohydrate Content? Here’s something that might surprise you: unlike their “people food” counterparts, pet food manufacturers are not required to tell consumers how much carbohydrate is in their products. In fact, until very recently, they were affirmatively prohibited from even mentioning carbs at all in the Guaranteed Analysis panel (AAFCO’s equivalent of the FDA’s Nutrition Facts panel). Only recently, after many years of lobbying by consumers, did AAFCO finally begin allowing producers to mention starch and sugar content in the Guaranteed Analysis panel (outrageously, total carbohydrate content still isn’t allowed). Naturally, most pet food producers choose not to make these voluntary disclosures. Instead, they make every effort—prominent images of wolves, emphasis on meat and protein content, products framed as “grain-free,” etc.—to suggest that their products are low in total carbohydrate content. They know consumers aren’t looking to stuff their pets with carbs. So, without addressing the issue directly, they make every conceivable effort to suggest that their “grain-free” products contain only a limited amount of carbohydrate. Unfortunately for consumers, the reality is usually quite the opposite. I know this because I’ve gone through the work of figuring out the carbohydrate content of the twelve most popular “grain-free” dry pet foods on the market today. In each case, I’ve either asked the manufacturer directly, tested the product using laboratory analysis, or calculated the total using the process outlined in this earlier article I wrote. Before I get to the results, I’d be remiss if I didn’t include information about Ketona Chicken Recipe For Adult Dogs (full disclosure: I was closely involved in founding the company that produces it). It’s a new “grain-free” dry dog food, and while it’s not yet a leading brand it does contain less than 8% carbohydrate (on as-fed basis). Which, as you’ll see, basically puts it in a category of its own. As you can see, all of the leading “grain-free” dry pet foods on the market today contain at least 20% carbohydrate. And several contain nearly 50%. 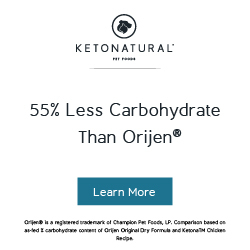 This means that Ketona, at less than 8% carbohydrate, is in a whole different realm than its leading competitors. They all contain at least twice as many carbs as it does. And some contain five or six times as many! It also means that several of the most popular “grain-free” products on the market today actually contain more carbohydrate than a leading grain-based product like Purina Pro Plan Savor Adult Shredded Blend Chicken and Rice Formula. Which ought to hammer home just how misleading the whole “grain-free” label can be in the first place. That’s it for today. Thanks for reading. I hope you found this article helpful and informative. Please drop me a line in the comments if you’d like to add anything or if you have any questions. I don’t feed grain-free in order to minimize carbohydrates. I feed it to my dog because he has a problem digesting corn and wheat. I have told people talking my nutrition courses for years that grain free is nothing more than clever marketing, that potatoes are no better than rice. It does often correspond to a switch to an overall higher quality food, so I think that is part of why some people swear by it. Grain free processed food for dogs has been very popular , but now their are concerns about DCM. Would Ketona be the best choice ? What other choices are available in the market that has high protein, moderate in fat and low in carbs? I went to shop for ketonatural but no option for puppies. I have a 10 month old shih tzu and a 7 yr old shih tzu. Should the average, healthy pet be on a grain-free diet? Not necessarily. Most dogs do great on dry pet foods that contain grains. In fact, some pets do better on diets with grains because of their high fiber content. When choosing a diet, I look for the Association of American Feed Control Official (AAFCO) seal of approval that tells me that the diet is nutritionally complete and balanced. In addition, I carefully read the ingredient list. I tend to gravitate to diets that have a single meat source with a few easily identifiable ingredients – it makes it easier later to identify and avoid ingredients should a pet experience diarrhea or have an adverse reaction. Whether a diet contains grains or not, is not a top criterion for me when it comes to selecting a diet for the average, healthy pet. Why would you write what seems like a great informative article, then at the very bottom say drop a line or questions in comments and then totally ignore them? Seems like just a marketing scheme then for Ketona. I switched my cats onto friskies and FF classic pate when I realized the grain-free foods were between 20-40% carb! I also cook liver/hearts/gizzards and such. So glad this issue is coming up more. Those companies are SHAMELESS.